(From Panasonic lens literature) Panasonic and Leica Camera have launched the development of a new Leica D large-diameter telephoto zoom lens, specifically designed for Panasonic's first digital SLR camera, the LUMIX DMC-L1 and other Four Thirds System compatible digital SLR cameras. The new LEICA D VARIO-ELMAR 14-150mm f/3.5-5.6 ASPH. lens will also feature Panasonic's MEGA O.I.S. (Optical Image Stabilizer) and become the first Leica D lens with range up to 300mm*. The new large-diameter 10.7x telephoto zoom lens, which meets Leica's stringent quality and performance standards will be just as light and compact as the previously released LEICA D VARIO-ELMARIT 14-50mm f/2.8-3.5 ASPH. MEGA O.I.S. lens, but provide a considerably longer telephoto range as a result of incorporating four aspherical lenses in the unit. The aspherical lenses and an ED (extra-low dispersion) lens will also improve optical performance of the lens by minimizing distortion, even at the 28mm wide end. "This powerful new Leica D Lens will become the ideal lens for shooting with the Panasonic LUMIX DMC-L1 in almost any condition because it will combine the lens' extraordinary zoom power with Panasonic's MEGA O.I.S technology," said Alex Fried, National Marketing Manager, Imaging, Panasonic Consumer Electronics Company. "With this lens, MEGA O.I.S. will deliver unparalleled telephoto shooting performance, especially when shooting without a tripod." Panasonic's MEGA O.I.S. also allows for slower shutter speed use and the ability to detect and correct hand-shake accurately using Panasonic's Venus Engine LSI, which will be incorporated into the lens. Additionally when the lens is mounted on the LUMIX DMC-L1, or the LEICA DIGILUX 3, photographers will be able to use the aperture ring provided and enjoy easy, intuitive shooting. This combination of an extended 28-300mm shooting range, Mega O.I.S., and an aperture ring for intuitive control makes the new lens perfect for capturing clear, beautiful, expressive images when shooting a wide variety of subjects and in a host of conditions. The First Leica D lens with Extra Silent Motor (XSM) Technology, which will assure quick, quiet control and exceptional responsiveness, accuracy and focusing stability. Minimum focus distance of 50 cm over the entire zoom range provides a maximum photographic magnification of 0.36x (35mm equivalent), which when combined with MEGA O.I.S. will allow for macro shots at the tele-end without using a tripod. 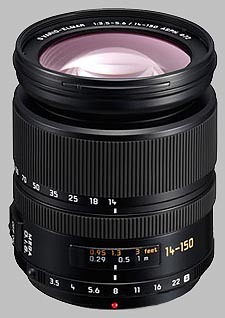 Circular aperture diaphragm that produces an attractive smoothness in out-of-focus areas. Multiple lens coatings will minimize ghosts and flare and help deliver premium optical performance. there is nothing better - its just Leica colors and metall! Use it on an Olympus E-510, which works fine. There is not too much negative i can say about his lens. It just a gem. The combination of a supersonic motor driven lens, that supports contrast autofocus and has a sharpness of the 12-60 SWD is simply great. Adding to this, the fact that you have a really superzoom that is not too heavy and with a outstanding sharpness at the long end, makes this a really perfect combination. No more lens switch, except in some occasions. At night and where more focal lenght is needed. There is only one drawback, maybe two. I have this lens now on my Olympus E-5 Body. Perfect match. It stabilizes the Video Recording while the IBIS is not active. It does not generate any noise while focusing in live view mode and it is accurate.